Korean Airline is one of the most excellent airlines to fly, with their comfortable and elegant planes and excellent services. Even economy seats get superstar treatment, which means that every flight you take will be one to remember. From their customer service to their focus on cleanliness and health, this is one membership you can be proud of. For those that use Korean Airlines frequently, SKYPASS is the frequent flyer program where you can earn miles and redeem them for flights. Since it serves some 45 countries (and the list continues to grow), you can always find something to do or somewhere to go. When you fly on Korean Airlines, every trip you take will earn you miles. There are partner airlines that will earn you points as well, including Alaska Airlines. Easier ways to earn miles include using credit cards that are attached to your account, staying at certain hotels, or specialty sales where you can earn a massive amount of Korean Airline miles. 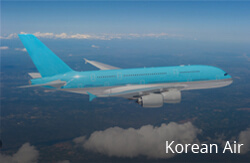 Buying Korean Airline miles is easy and can help you in many situations. Most often, people will buy airline miles to top off a reward that they just haven’t reached yet. This can something as simple as a flight in economy or something as special as an upgrade to business or first class. Another option is to buy Korean Airline miles to keep existing miles active. This is most common for people who don’t travel quite as often and have a massive amount of miles that are about to expire – just buying the minimal amount means that the rest of your miles stay active. There are many different times to use your Korean Airline miles. The best is for a trip within or to Korea. You can update to first class which will be an absolutely amazing experience for anyone. You can also use it to plan a stopover on your flight for another trip (or an extended stay). Korean Airlines also has great programs to Hawaii, Tahiti, and the Caribbean that cost many miles less than other airline miles. Overall, Korean Airlines is an excellent airline with a fantastic (and user friendly) rewards program. If you have to cancel your flight, there is a chance that you can get your miles refunded. In some cases, just what you have to do to get your miles deposited back into your account varies by program, and sometimes varies due to the level that you are on within that program. Regardless, it is likely that you will have to lose some miles in the process. For Air Canada, for example, a cancellation fee for an award ticket is $90 without any exceptions. For Alaska Airlines, it is free 60 days prior to flight but costs $125 if it is within 60 days – however, MVP Gold and MVP Gold 75K members don’t pay at all. Your status has more to do with how much it will cost you – sometimes, higher ranked members won’t have to pay at all. The other option is that, if you are able to rebook immediately, you might see a benefit in that as well. One of the good things with most programs is that you can change the date of your departure if it is more than 21 days into the future as long as the new date is also 21 or more days into the future. Another thing to consider is that larger airlines are typically less forgiving when it comes to redepositing your miles. One of the trickier things you can do to avoid paying redeposit fees or losing your miles altogether is to simply wait it out. If your flight departure time changes, you might be able to put up a fight because it will throw off your travel plans. You might also be able to call a customer service associate, hear what they have to say, and then call back again. Sometimes, one worker will do something that another will not. This is generally the case if you are able to get someone with more power. It is very important to know the policies of your program if you know that you will have to change your flights on a regular basis. Look for programs that will have lower and no redeposit fees. Another thing you may want to consider is travel insurance, which may reimburse any cancellation or redeposit fees. At the end of the day, changing or canceling your flight is costly to your miles, but you are likely to be able to get at least some of them back when you do. There have been numerous times when people have thrown away their reward points and travel miles because they think they have become useless. This is not the case however, as you never know when the miles and the points may come in handy. If you like to travel then it is highly recommended that you start investing in Hawaiian Airlines Miles. Don’t you love to get free stuff? If yes then you need to start searching and get rewarded for it too! The Hawaiian Mile Finder is a toolbar that allows the members to download it and use it for searching. If you do enough searches you can earn up to 1000 miles every month. For every 3 searches you do, you get 1 Mile. Imagine doing this for a year and getting 12000 free miles! In fact, you can get your family and friends on this too and earn even greater number of miles year round. So why not save on your next holiday by earning these free points and spending on your travels. As mentioned earlier, you can get your family to start earning Hawaiian Miles and the y can share them with you for free over your Visa card. There is so much you can do by simply having your family and friends transfer some miles your way. For example, if you are short of some points in order to get a bonus, you can ask your close ones to send some of those points your way. What if you get the chance to convert your points into some other honors you wish to use, such as the Hilton Honors. You get a ratio of 1:1.5, which is something no other reward program offers! You can get your reward points redeemed to other several rewards online without you having to talk to any of the customer service people. You can even redeem your miles to travel to amazing places like the French Polynesia and Australia. All this can be done easily online! You don’t have to be an elite member to benefit from the Hawaiian Airlines reward points. Regular members also get occasional deals on redemption rates and discounts on baggage fees. For families, these discounts can save a lot of money. For those who frequently fly to Asia, Cathay Pacific Asia Miles might be one of the best programs you can enroll in. The airline offers frequent trips that are affordable, which means that you are likely to get a lot of bang for your buck when it comes to using your miles and earning them. Cathay Pacific is continually offering new and improved ways to reach your location. If you like to fly business or first class, it is even easier to redeem your rewards. There are so many ways to redeem your miles. You can redeem online on Dragonair, British Airways, and Qantas Airways or by phone on many others, including Aer Lingus, Air China, airberlin, American Airlines, British Airways, Iberia, Malaysia Airlines and more. To earn Cathay Pacific Asia miles, you can fly with Cathay Pacific Asia or any of their partner airlines. You can also stay are partner hotels or use a rewards credit card. NO matter what you do, the miles add up very quickly, especially when compared to the other airlines. You have to know that with Cathay Pacific Asia Miles, there are a lot of rules and things that you need to learn. However, once you know them, you will be able to use all of the online platforms easily. There are so many opportunities with this rewards program, though you do sometimes have to act quickly in order to get your seat. While it might seem annoying that you have to call for so many airlines, it can actually work to your advantage. Itineraries are possible when you talk to a customer service agent that you might not have found on your own – this will save you from wasting time and help you to get the best possible trip. Many people believe that Cathay Pacific Asia has the easiest system to redeem miles as well – you can easily see everything that you are getting, see any limitations, and see how you can move your itinerary. Buying airline miles is an easy way to cap off your miles when are nearly at the limit for a trip you want to take. Even better, you can use them to quickly upgrade seats you already have or to reach a new level before your points expire. Also when you buy miles, you are not only adding to your total so that you can get to the next tier on Cathay Pacific Asia but it can also help keep your miles account active. While some may be afraid to buy airline miles, doing so can help you take that trip to Asia that you have always dreamed about and in the end may save you money as well. The program also partners with Alaska Airlines, Japan Airlines, Copa Airlines, and more. The program has four levels: Ivory, Silver, Gold, and Platinum. Each one has its own set of requirements that you can traverse. Once of the reasons that this is so popular is because it doesn’t just go to the “major” destinations – it goes to remote parts of the world. You can earn Flying Blue miles by flying on the above airlines or staying at partner hotel. You can also use credit cards connected to your account. Chase Ultimate Rewards is one of the best ways to earn miles. You can also earn points with American Express, Citi ThankYou, and Starwood Preferred Guest. Certain rewards programs will have bonuses for Flying Blue if you sign up during the promotional period. Miles have a lifetime of about 20 months if you do not gain them. To keep them active, you can either earn more using the methods mentioned above or you can purchase miles with cash. You can redeem Air France Flying Blue miles by going online and searching for a route that fits your needs. There are many perks and promos that will give you more bang for your buck, so you may want to do some research if you are open to where you will go. Many people believe that Air France Flying Blue Program has one of the best tools to finding flights that will fit within your miles – something that will save you a lot of time. Another reason this airline program is so popular is because there is such great availability – you will find very few blackout dates. Air France Flying Blue Program is very popular and it continues to get better and better. If you start gaining points now, you will be able to take dream vacations quite regularly just by doing the things that you do now. Emirates Skywards is the Emirates Airlines frequent flyer program. If you fly on this airline often, you might find yourself accumulating miles that you can use. You can also earn miles while you travel with Emirates partners, use a reward credit card that has partnered with them, or stay at a partnered hotel. What Are Emirates Skywards Miles? As stated, the Emirates Skywards are the frequent flier program from Emirates Airlines. The more you fly with this airline, the more miles you will get. Of course, there are other ways you can earn them. There are many hotels that you can stay with as well that can help you earn more miles. Why Should I Buy Emirates Miles? Why should you buy Emirates Skywards miles if there are so many ways to earn them? There are many situations in which buying Emirates Skywards miles are the best option for you. You may want to get luxury treatment, you may want to make a vacation one to remember, and you just might want to keep your miles active. Experience Luxury: If you want to travel in style, many people will buy miles so that they can purchase upgrades. You might be really close to that threshold and you just want to top off your miles, or you could be further away but you think it is worth it. Flying luxury is something great about Emirates, so you want to ensure that you get to experience it. You Are Close to a Reward: Rewards are great – whether they are access to a luxury lounge or that aforementioned upgrade, if you are close to a reward, it is certainly worth it to buy a few more miles to get yourself there. Points Are About to Expire: The best reason to buy airline miles from Emirates Skywards is to keep your points active. Many people will save their miles for years and years to get where they want to be, especially if you don’t fly that often, and if you go a long time between using your rewards card or flying, your miles will expire. All it takes is a simple purchase and you will be ready for your next trip. How can I Buy Emirates Skywards Miles? You can easily purchase them with the Miles Broker. We provide a safe and easy way to buy miles from some of the top airline carriers. For more information, click here. Singapore KrisFyer miles program is one of the most popular miles programs in the world, and it should be – it offers some amazing perks that you cannot get any other way. What Are Singapore KrisFlyer Miles? Elite Miles can only be earned with some airlines – namely, you cannot earn them on Alaska Airlines and JetBlue. Instead, the focus there is more on the alliance airlines. You can also earn miles by using specific cards and staying with partner airlines. KrisFyer Miles are the ONLY way to get into the premium cabins on many different flights. This is a perk that many people will enjoy, especially for longer flights. Why Buy Singapore Airlines KrisFlyer Miles? Upgrades: Want access to that luxury travel? Many people will purchase upgrades because they are very close to getting a specific class of travel that they want. For example, if you want to fly in the ultra luxury cabin, you can only get to it by using your miles. If you don’t have enough, you will have to purchase them to get the rest of the way. You Are Close to a Reward: If you are close to a special reward that you want to use, why just miss it? When you buy miles, you will be able to get what you want without having to worry or wait out other travellers. You want to move to the next tier: If you are interested in moving to another tier for the year and you are very close, buying miles will help you to get there so that you can enjoy the extra perks. Points Are About to Expire: If you have spent a lot of time amassing your points and you don’t want them to expire, you need to add to them. If you aren’t going to fly anytime soon, you can buy your airline miles to keep them active. You can easily purchase Singapore KrisFyer miles with the Miles Broker. We offer a simple and safe way to get you the miles you need for your next trip. United Airlines is one of the biggest airline companies in the world, and one of three that serves the United States. Their miles program is also one of the most popular because they have so many options for redeeming your miles. Many people have questions about buying United Miles – so let’s break it down. In order to get into the United Miles program, and to go from tier to tier, you have to earn PQM, or Premier Qualification Miles. You do this by flying on United or an affiliated airline. You can also do this through using an affiliated credit card, staying at affiliated hotels, or buying United Miles. In order to get to each level, you will need 25,000 PQM, 50,000 PQM, 75,000 PQM, and 100,000 PQM respectively. As you travel, you gain miles that will have an expiration date. You need to continue to earn miles to keep them active. You have miles that are about to expire: Every mile that you get will be renewed when you earn more. If you do not have a credit card to use and you are trying to save up for another flight or a special trip, buying United Airlines miles will help you to keep everything active and get more miles at the same time. You want to upgrade: Many people will buy miles because they are on the cusp of getting another perk that you might want. For example, if you are going on an international flight that is extremely long, and you are only a few miles away from a better ticket in business class, you will want to pay a little more money to get that ticket – and you won’t have time to earn the miles any other way. You want to move to the next tier: If you have a lot of flights coming up in the next few years, you may want to move into another tier so that you can enjoy all of the perks every time you fly. If you are looking for a safe and easy way to buy United miles online, we can help! The Miles Broker offers a simple solution that allows you to easily buy miles that you can use for your next trip. For more information about our services, click here. If you are an AAdvantage Member, that means that you get to earn and use AAdvantage Miles whenever you fly on American Airlines and American Eagle flights – as well as when you fly with other affiliates. You can also earn points using a AAdvantage MasterCard or CitiCard, when you stay at affiliated hotels, rent cars, or book vacations with any American Airlines partner. While isn’t necessarily difficult to understand AAdvantage Miles, there are some things you might need to know before, during, and after usage. It’s very simple – the more money you spend, the more you will make. You can also collect EQS and EQMs, which have a similar tier structure. Other ways to earn miles include using companies like Budget, Avis, Royal Caribbean International, Carnival Cruise Lines, Hilton, Hyatt, and Starwood. Running low on miles for a reward you want? Stockpiling miles so that you can use them at a later date but the expiration date is coming quickly? You can purchase miles to help top off your number or to keep your miles active. It is just a little way to ensure that you get to use your AAdvantage miles how you want, when you want, and where you want. You can also request to reinstate your miles, but that sometimes costs points or money. There are so many great ways to use your AAdvantage Miles, but the best way might be using them with partner airlines. You might have to do a little searching around and research, but there are some great deals to be had. For flying domestically, check out the monthly reduced mileage awards. Of course, you don’t have to use your miles on flights. You can use them as points with many of the partner sources as well. There are always new partners coming on with AAdvantage Miles, so you want to make sure that you read up on it. A few other things to note include the fact that elite members will receive complimentary cabin upgrades on flight that are under 500 miles. You can also change your reward reservations, but sometimes there will be a fee if tickets need to be reprinted. You can even share your miles with friends or family, for a fee, but they do not count toward elite status qualification.